Board Game Night with Isle of Games and Bookmans Midtown Bookmans Entertainment Exchange Midtown 3330 E. Speedway Blvd. 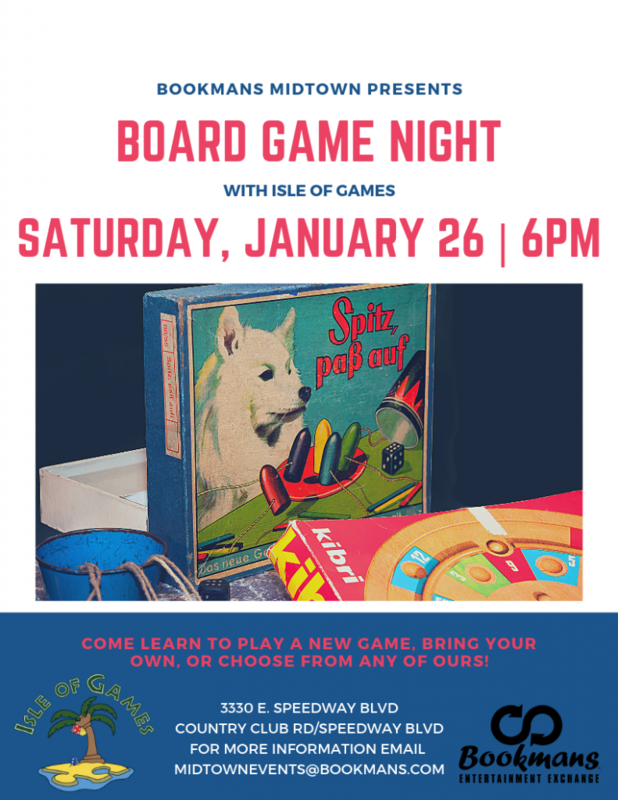 26jan6:00 pm8:00 pmBoard Game Night with Isle of Games and Bookmans Midtown6:00 pm - 8:00 pm Bookmans Entertainment Exchange Midtown, 3330 E. Speedway Blvd. It’s time to bust out the board games and get the dice rollin’! Bookmans Midtown and Isle of Games will be hosting a Board Game Night on Saturday, January 26th starting at 6 PM! You can also choose from our enormous stock of board games or bring your own and play them in our store with a bunch of like-minded people! This event is completely free and open to all ages and experience levels. Hello Grace and Happy New Year! To reserve seats, please email MidtownEvents@Bookmans.com! Thanks! The the board game night include chess? We have a variety of games available for play. Just ask about chess when you get there and I am sure that Isle of Games and/or Bookmans will be able to get a game going!